Slocan Valley Threads Guild meet next on Wednesday, April 10, 2019 at 7:00pm. Our first evening meeting this year. The Winter Schedule for meetings will start in November. Gab’n’Jab will still take place over the summer 7-9 contact Haya or Sharon or Monique to attend. You can also use the contact form below. Remember to bring to general meetings your projects to share. Library update – Everyone is encouraged to sign out our great collection of books and mags. And also to BRING THEM BACK please. Recommended loan time is 1 month – give someone else a turn. You can always get it again later on. November sees meetings change over to Second Sunday of the month at 1:00pm through the winter. April sees meetings change over to the second Wednesday of the month in the evening 7:00 – 9 over spring and summer. Gab N Jab – Wednesdays 7 to 9 pm. Please use the contact form below to register so that we know to show up to open the building for the evening . If you are interested in hosting a member’s day to share your skills, please let us know by using the contact form below. Members are kept updated with a weekly e-mail from our communication coordinator. Donations of fibre related goods are always being accepted for Yard and Yardage, If you have any fabric, yarns or tools, equipment or craft supplies to donate please use the contact form above to let the guild know. Thank You to all past donators to this yearly fundraiser and thank you to all members for contributing your time and goods. 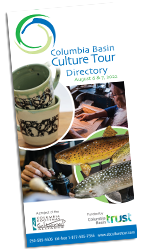 Yes, the Slocan Valley Threads Guild was a participant in the 2015 Columbia Basin Culture Tour of August 8th and 9th. August 12 , 13 2017 will see the guild once again participating. SVTG members had fibre works on display and were working on demonstrations of various fibre arts. Check the Recreation #8 Slocan Valley Leisure Guide for classes being held at the guild. June is when our Annual General Meeting is held. We hold elections of board members. You need to be a member to be elected to the board. You can become a member for $10 at this meeting or anytime. Put your name in the hat for a board position. A variety of positions open up each year. Watch our webpage for Summer Events. The Threads Guild hosts an Open House in October on a Sunday 1-4. Check our webpage in September for date. Come tour the guild, have a treat or two, check out our library, member’s work and become a member. This year there will not be an open house. Come to a regular meeting to check us out if you want. 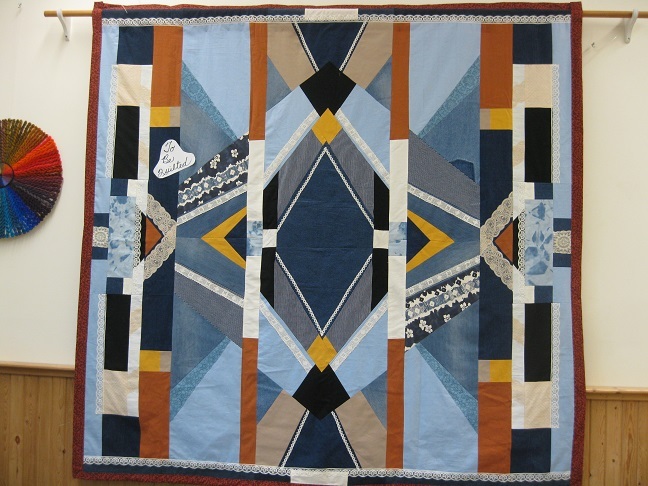 Here is the quilt that members made which was raffled off at the 2014 Open House. Thank you to everyone who supported this fundraising event. I love the photos at this website and how up to date it is, ex. date of next meeting. I came to verify the date of Y&Y and it was here.